I always tell my trainees that “your patient is bleeding to death until you can prove otherwise.” Sometimes bleeding is obvious in our trauma patients and sometimes it isn’t. The usual routine for assessing major trauma patients involves a blood draw, with a high priority on obtaining a specimen for the blood bank. But most centers also get standard analyses on the blood, including CBC, lytes, etc. 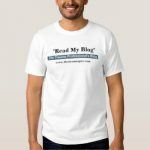 But remember, a blood draw is a snapshot. And it’s a snapshot of values that change relatively slowly. This means that you can get suckered into believing that your patient is okay because one set of labs looked pretty normal. And it’s impractical (and uncomfortable) to get labs frequently with repeated needle sticks. Masimo, a medical equipment manufacturer, has added something extra to the pulse oximeter that you are already familiar with. 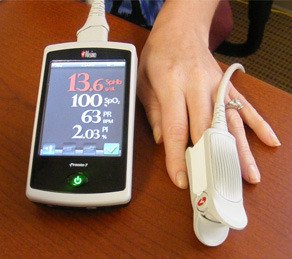 Using the usual clip-on finger probe, it measures arterial oxygen saturation, pulse rate, perfusion index, and total hemoglobin. 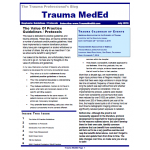 Bottom line: This is an interesting new tool for acute trauma care. The only downside that I see is that we may lose sight of the fact that hemoglobin values lag behind as an indicator of true blood volume in rapidly bleeding patients. We mustn’t be fooled into thinking that everything is fine just because a number is normal. There’s still room for common sense! And don’t start monitoring serial hemoglobins willy nilly in solid organ injury just because you can. You still don’t need it! Reference: Transforming hemoglobin measurement in trauma patients: noninvasive spot check hemoglobin. J Am Col Surg 220(1):93-98, 2015.